Home › Technology Enhanced Learning › Learning together: Technology enhanced collaboration. Learning together: Technology enhanced collaboration. Peer learning and small group activities have long been staples of higher education – and with good reason. Working together develops students’ understanding of the topic alongside teamwork skills which are so important for employability and lifelong learning. Professionals across a wide range of disciplines now work together online and students can benefit from exploring digital collaboration as part of group work. There are many apps, tools and platforms which allow learners to work together to produce anything from ideas to whole projects. 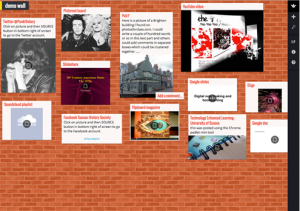 This post will outline some different options, with a focus on Padlet, a versatile virtual ‘wall’ which can be used in a wide variety of ways. Padlet walls can now be embedded in Study Direct, the University of Sussex VLE, to make them part of a module learning experience and we have produced this Guide to using Padlet to help you get started. An iPad app for Padlet has also been released. You can’t beat sticky notes for gathering lots of ideas from a group then organising them. The Post-it Plus app for iPad and iPhones goes a step further, making it possible to capture the paper notes and re-organise and share them so that work can continue after the session. Once the initial ideas are created it is time to discuss and plan. A group forum or live chat in Study Direct could be used. Alternatively, the ‘stream’ layout on Padlet, where posts are displayed one after another, can be great for sharing ideas along with resources and examples. 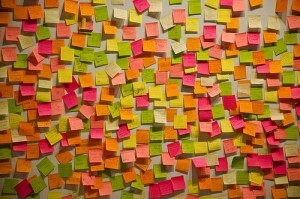 With many tasks to do and several people to organise collaborative projects can benefit from some organisation. There are lots of tools for team projects such as Trello, but you can also use Padlet’s ‘calendar’ wallpaper to turn it into a basic planner. Our A-Z of apps includes several tools for collecting and sharing resources such as Diigo and Flipboard but Padlet is a great alternative for groups to share websites, images, documents, sound files, YouTube videos etc. Students can also collaborate on the presentation or poster that will share their learning with the rest of the class. Presentation tools such as Prezi for Education, Google slides and PowerPoint (using OneDrive) allow multiple editors to work together on a presentation. If you want a digital ‘poster’ that all the students can see via Study Direct, why not try using Padlet to present? The ‘freestyle’ format allows mixed media posts to be re-arranged to create a visually engaging and informative digital ‘poster’ which can be shared or printed. If you would like to discuss how to use Padlet or any of the other collaboration tools mentioned here please contact the learning technologist for your school. 2 Pings/Trackbacks for "Learning together: Technology enhanced collaboration."